The Twilight Saga: New Moon, commonly referred to as New Moon, is a 2009 American romantic fantasy film based on Stephenie Meyer's 2006 novel New Moon. 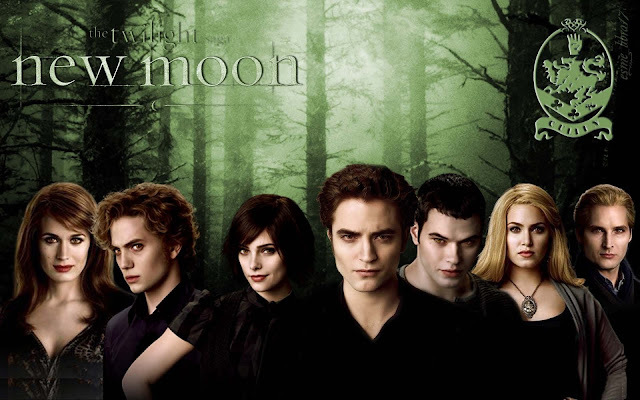 It is the second film in The Twilight Saga film series and is the sequel to 2008's Twilight. Summit Entertainment greenlit the sequel in late November 2008, following the early success of Twilight. Directed by Chris Weitz, the film stars Kristen Stewart, Robert Pattinson, and Taylor Lautner, reprising their roles as Bella Swan, Edward Cullen, and Jacob Black, respectively. Melissa Rosenberg, who handed in a draft of the film script during the opening weekend of Twilight, returned as screenwriter for New Moon as well. Filming began in Vancouver in late March 2009, and in Montepulciano, Italy in late May 2009. The film was released on November 20, 2009 in most countries, and set domestic box office records as the biggest midnight screening, grossing $26.3 million, which was superseded by its sequel, The Twilight Saga: Eclipse. This led to the highest single day, domestic gross on an opening day, with $72.7 million, until it was beaten in 2011 by Harry Potter and the Deathly Hallows – Part 2, which made $91.1 million, by nearly $20 million. Furthermore, New Moon opened with the third highest domestic opening weekend since 2002 grossing a total of $142,839,137. The film also became the highest grossing film released by Summit Entertainment, and was the widest independent release, playing in over 4,100 theaters in its theatrical run, until it was surpassed by The Twilight Saga: Eclipse. New Moon was released on DVD and Blu-ray Disc on March 20, 2010 through midnight release parties. As of July 2012, $184,916,451 in North American DVD sales, selling more than 8,835,501 units, 4 million of which were sold within its first weekend, beating Twilight's 3.8 million units sold in its first two days. The film was well received by fans, but received mixed to negative reviews from critics. On her 18th birthday, Bella Swan wakes up from a dream in which she sees herself as an old woman. She expresses her distaste with growing older than her boyfriend Edward Cullen, a vampire who stopped aging physically at 17. Despite her lack of enthusiasm, Edward's adoptive family throws Bella a birthday party. While unwrapping a gift, Bella gets a paper cut, causing Edward's brother, Jasper, to become overwhelmed by the blood's scent and attempt to kill her. Realizing the danger that he and his family pose to Bella, Edward ends their relationship, and the Cullens leave Forks, Washington. Edward's departure leaves Bella heartbroken and depressed for months; however, when her father, Charlie, finally decides to send her to live with her mother in Florida, Bella refuses and agrees to spend more time with her friends. After seeing a movie with Jessica, Bella sees a group of men on motorcycles. This reminds her of when Edward previously rescued her from an assault, and she sees his image warning her to stay away. Bella discovers that all thrill-seeking activities evoke Edward's preserved image. She is also comforted by Jacob Black, a cheerful companion who eases her pain over losing Edward. When Jacob suddenly begins avoiding her, Bella discovers he has become a werewolf, an age-old enemy of vampires. Jacob's pack members are on constant patrol for Victoria, a vampire who wants to avenge the death of her mate, James, who was killed by Edward in an effort to save Bella from him. That leaves Jacob little time to spend with her. Alone again, Bella returns to seeking thrill-inducing activities. Through a series of miscommunications, Edward believes Bella has killed herself by jumping off a cliff into the ocean. Distraught over her supposed suicide, Edward travels to Italy to provoke the Volturi—a powerful vampire coven capable of killing him—by exposing himself as a vampire to humans. Alice, Edward's sister, and Bella rush to Italy to save Edward, and arrive just in time to stop him. It is then that Edward tells Bella that he always loved her and only left to protect her. However, the Volturi determine that Bella, a human who knows that vampires exist, must either be killed or transformed into a vampire herself. Alice stops them from killing her by sharing her premonition with Aro (Michael Sheen)—a Volturi elder who is able to read thoughts through touch—in which Bella has been transformed. Soon after, they return to Forks and Bella forgives Edward for leaving her. The Cullens vote in favor of Bella being transformed into a vampire, much to Edward and Rosalie's dismay. Later on, Jacob reminds Edward of the treaty the Cullens made with the Quileute tribe: they will not attack each other, as long as the Cullens do not bite any humans—an action necessary for Bella's transformation. The movie concludes with Edward telling Bella that he will change her into a vampire after she marries him. READ THE INFORMATION CAREFULLY. IT IS ONLY 5 ROWS AWAY.